Ashley says, “I totally took my bathroom for granted before this happened!” Anyone who’s had work done on theirs can relate to that. At least she was rewarded for their trouble with this pretty new space now that it’s over. 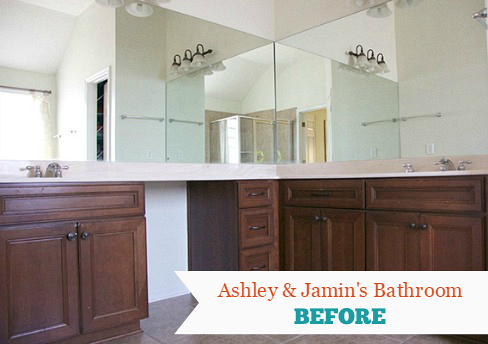 Thanks to Ashley and Jamin for sharing their makeover with us. I love it! 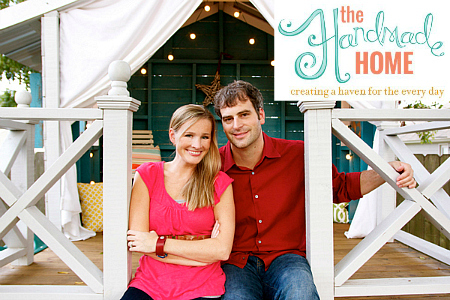 Visit their blog The Handmade Home for more information! 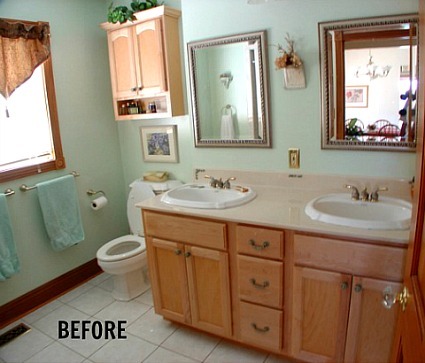 It’s a shame that these homeowners were forced to do a complete bathroom gut, before it was due, but what a transformation! It seems that the original bathroom wasn’t really their style anyhow. 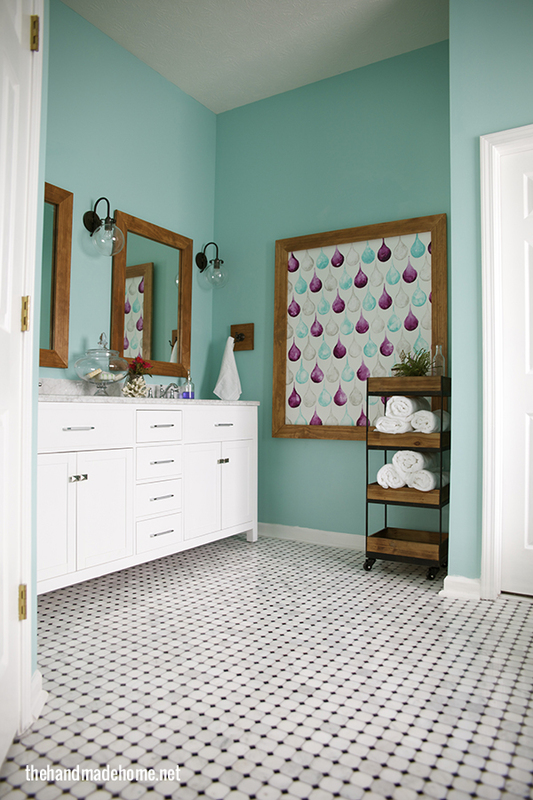 Love everything about the new bathroom….especially the clawfoot tub. Green with envy! Lovely but…. would you really want to more than halve the counter space in your master? 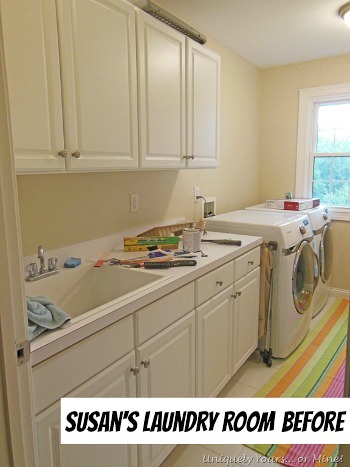 If the closet has a built in vanity area maybe you could get away with it, but otherwise they’ve gone from two large counters with sinks to one counter with two sinks. Had the exact same thought, Jennifer! Who really gets ready side by side and needs two sinks? I’d much rather have the counter space! 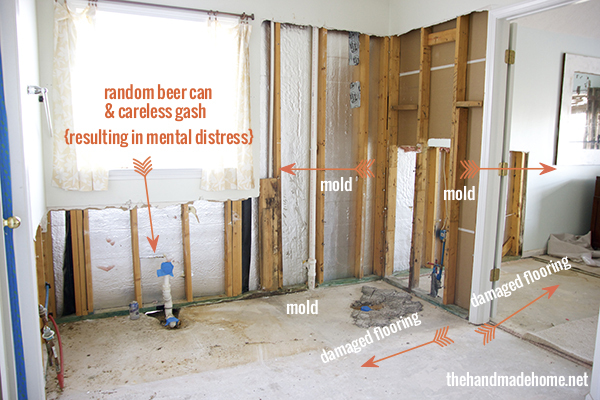 We are looking at a whole bathroom re-do due to the same issue. I hope ours will look as lovely when we are done. Oh, man, sorry to hear that, Carrie. Good luck with yours! It definitely has a lot more personality now. While I’m not really a fan of the wall color, I think the tub/shower side is very nice. What a transformation! It always amazes me how people can take such ordinary, bland spaces and transform then into something so special and unique. I love seeing finished results like this. The tub is probably my favorite new feature, but I also love the blue and the tile work. beautiful redo. 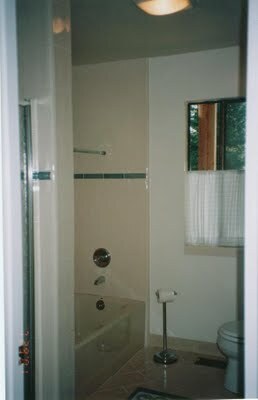 The only thing I would add may make me sound like a codger, but experience taught me that a grab bar in a glass shower is a must, especially since they make such attractive ones now. That way you can enjoy the fruit of your labor that much longer! I love this bathroom. Nothing is what I would choose but some people just have a knack for making things look good. Well done to Ashley and Jamin. Wow! 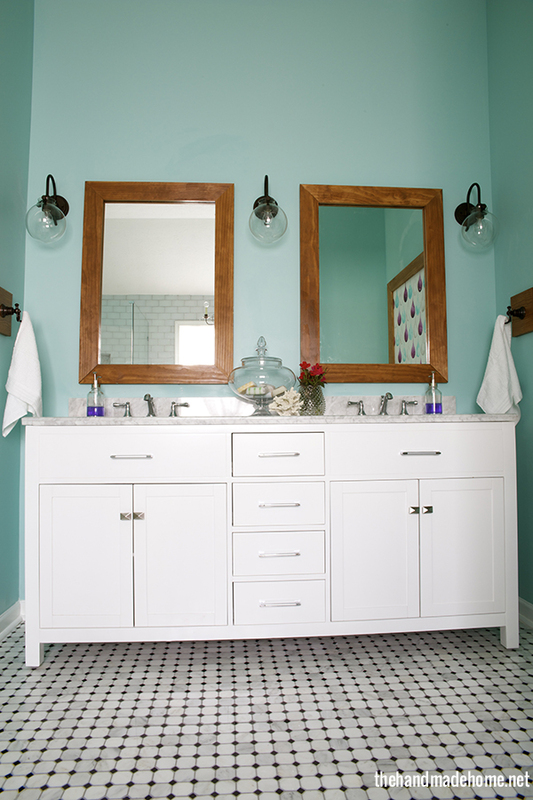 Quite the transformation on a bathroom that I probably would have been happy with before! But the finished product is absolutely beautiful! While not a huge fan of the sink area, the shower and tub are breathtaking. I’ve been an owner of a clawfoot tub and it’s awesome! I also love the painting of the drops! I’ll check it out — thanks, Maria!